I had been missing Vietnamese food since I’d lived in Berlin and here in Lisbon you can’t find any. 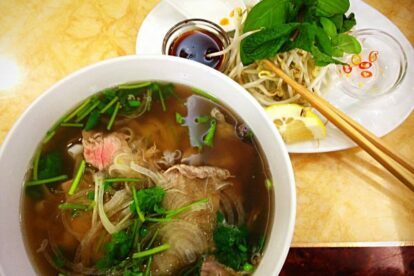 Fortunately, Pho Pu opened and I was there to taste the amazingly fresh and vibrant Vietnamese cuisine. The place is small and busy, but luckily you won’t have a problem finding a table. It’s located at one of my favourite streets of Mouraria quarter, Rua do Bem Formoso, just two blocks from Martim Moniz square. The menu is quite simple. I started with some fresh vegetarian gyozas with cold beer as I impatiently waited for the pho. When it finally arrived, it had everything I was wishing for: the fresh watercress and cilantro served in a side dish with the hot chillis, and the pho: a well seasoned, clear but very tasty chicken broth with soy bean sprouts, combining the pungent, strong aromas from the fish sauce with all the spices. Delicious! Definitely a place to try. It’s really cheap and serves generous portions.